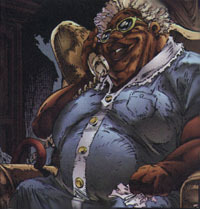 Grandma Blake First Appearance: Spawn # 12. What's the Story? : Sometimes one sees most clearly when the eyes aren't in the way. When physical vision has failed, the inner senses can compensate. Granny Blake has been blessed with vision and perception from her very soul. Granny is someone people naturally open up to. No pity is put upon her, because she is in no way diminished by blindness. In fact, her loss of eyesight to glaucoma struck her almost as a gift. "The good lord didn't take my eyes from me, honey," Granny said to her inquisitive young great-granddaughter, Cyan. "He just put my sight in a more useful place. In my heart." Wanda's ties to her grandmother are strong. Granny's deep belief in family and sturdy morals, honed during her 70-plus years, have been the guiding factors in Wanda's own life. The family matriarch has surpassed many hurdles, from adolescence during the Depression of the 1930s, to the loss of her husband of four decades, to uprooting and resettling at an age when most people would just sit back and let life happen. This tendency, to go ahead against all sense when you know it's right for you, is something she also sees in Wanda. It kept them close when the girl, still a teenager, chose to stay with her Gran in New York rather than move with her folks back to South Carolina. Wanda's first husband, Al Simmons, was quickly welcomed as family by the open-hearted older woman. Al enjoyed Granny's good-natured sense of humor, a counterpoint to his own quick wit. Sometimes he let his guard down, though, and she could sense the conflicts deep in his soul. She did her best to soothe these unspoken torments. When he was killed, all Wanda would tell her was that he died for his country. Since his "rebirth," Al has visited Granny fairly regularly. She feels he won the battle which plagued him and that God has sent him back as an angel. That she would hold such a view, at odds with Al's actual role as a Hellspawn, is something he has yet to sort out. Granny Blake's acceptance of Terry Fitzgerald, Wanda's new husband, has been a relief for Granny herself as much as for Wanda. The addition of Cyan, their child, has been a source of great joy and helped heal the loss of Al in the hearts of both women. Unknown to Granny, the darkness is planning to engulf her. The manipulative Jason Wynn sees her as a pawn in his plans for torment and disruption in the world of Spawn/Al Simmons. So far, the situation has worked in her favor, but storm clouds are gathering.